It is a buyers market! True! The deals are selling! Also true! If you are seriously looking to buy: this is the time to make offers! Almost every property that I have featured as a great deal is under contract. There are great deals in the current market and they are listed by many agents. All Realtors in Monroe County have access to all listings in the MLS (Multiple listing system). I gather the deals from that source and not just from my listings. If you choose to work me as your Real Estate agent you can rest assured that you will know first about the best deals. Right now it is especially important that you work with a seasoned local Realtor who knows the market inside out and who is as involved in the market today as they were 5 years ago. It is essential that your Realtor knows off the top of their head what is selling NOW. Not 6 months ago, not 2 years ago but NOW. An involved Realtors will know figures that are not published yet and in this market that knowledge can save you a lot of money! I have three properties under contract and just closed on one that came directly from readers of this blog. All of them are purchasing properties below the current market value! If you are ready to buy NOW this is the time to contact me at 305-393-0923 or Wiebkewestedt@aol.com If you are watching the market for a while before making a purchase please continue to read my blog; I provide you with all the facts and data to become an educated buyer. Thanks for reading my blog! As of May 1st 2009 the mortgage industry has experienced major changes in the way we conduct business. The HVCC reqiuirement for conventional loans reads as follows. No employee, director, officer or agent of the lender or any other third party acting as joint venture partner , independent contractor, appraisal management company or partner on behalf of the lender shall influence or attempt to influence the development , reporting, result or review of an appraisal through coercion, extortion, collusion, compensation, instruction, inducement, intimidation, bribery, or any other manner. Basically the lender or broker can no longer have direct contact with an appraiser but can only order an appraisal through a management company that will then contact the appraiser and place the order. *CMA's and Comp Requests will not be allowed. *Mortgage brokers will not be allowed to order appraisals. *Mortgage brokers or loan officers cannot request specific appraisers. *COD payment for appraisals will not be allowed. *Value pressure on appraisers will not be allowed. *"Value Shopping" by the lender is not allowed. *Withholding timely payment is prohibited. *Borrowers must be supplied a copy of any appraisal. *Required 10% re-appraisal or review of reports. *Lenders will be held accountable for appraisal quality. *LENDERS will be REQUIRED to report appraisers to State Boards of Real Estate Appraisers if appraiser misconduct is suspected. And, finally, the lender MUST provide a copy of the appraisal to the borrower not less than 3 (three) BUSINESS days prior to closing. If you check my daily updates on the right hand side you already know that Real Estate is really starting to move in the Keys.The best deals are selling of course. Inventory is slowly starting to decrease. A lot of buyers I am working with have been watching the RE market for quiete some time and are confident that this is the right time to buy. Frank is a Mortgage broker many of my cutsomers have used. He is good, competetive and communicates extremely well with all involved parties during a Transaction. I asked Frank to contribute some Finacing facts to my blog every so often. In order to qualify for a second home loan there are a few parameters to look at. Lenders look at three main factors :Capacity, Credit, and Collateral. One needs to show the income or capacity to repay the loan. Present mortgage, credit debts such as credit cards, car loans and the new mortgage for the second home must not exceed 36% of your income. There is some flexibility if your credit and liquid assets are strong compensating factors. Also one needs to show assets sufficient for the down payment as well as monthly reserves of at least 3 months. The credit score requirements on most second home loans are at a minimum of 680. After checking all 3 credit repositories the lender drops the high and the low score and uses the middle score. Apart from the score being good there must not be any recent lates ,especially not on your current mortgage. The higher the score the better the terms. If the property your are buying is in fairly good shape and has no outstanding violations this should not be a problem. An appraisal report will indicate most of what the property entails and give the bank the collateral it needs. The lender requires a condo questionnaire form from the condo association to find out if there is any pending litigation or poor mismanagement that could cause the values to be affected. The lenders do have plenty of money to lend and will do so gladly if the borrower qualifies correctly. 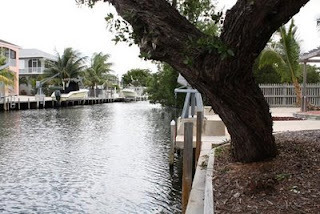 Canal front home in Islamorada under 440K If I could I'd buy it! Under Contract! Wow this is a great deal! This property is an REO located in Plantation Key Colony on an oversized lot on a wide canal. If I could buy something right now: This would be it! If you have any questions regarding this property or would like to make an appointment to view it please call me at 305-393-0923 or e-mail me at Wiebkewestedt@aol.com . Don't wait too long. This won't last!